Evernote has today rolled out a new update for its Evernote iOS application which brings with it a number of new features including home screen customisation for users. Once installed the new Evernote update allows Premium users to reorder the navigation links or removed items theta are not used completely from the home screen menu. Providing a fantastic new feature to the Evernote application which has made it even more user-friendly. As well as the new home screen customisation features Evernote has also added a new Places View feature that has been designed to enable you to recall and relive your memories via your notes. When you create a note your location will be recorded by Evernote allowing you to then view them on a worldwide zoomable map showing all your notes and where you created them. Making it even easier to see the location of your travels and thoughts and memories along the way. The new Evernote update for iOS also brings with it a number of bug fixes and performance tweaks enabling you to enjoy full integration with Apple’s latest iOS 7 mobile operating system. 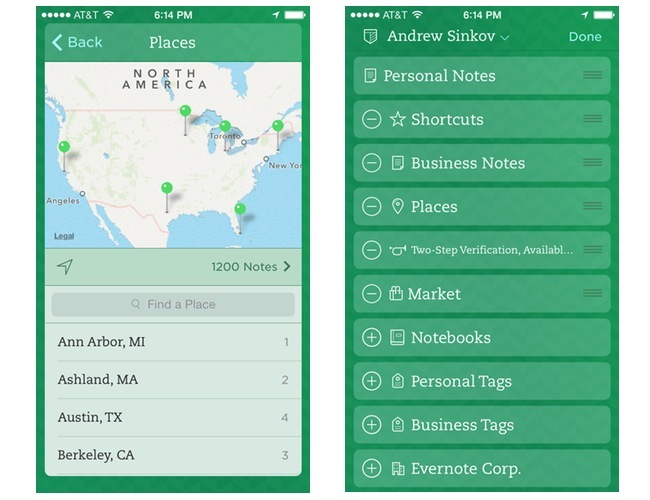 For more information on the new Evernote iOS update jump over to the Evernote Blog for details.